The following procedure describes how to order a correct length Wills Wing hang loop to obtain the right hang height on a Wills Wing glider. Optimum comfort and control of your glider requires that you be hanging at the right height above the basetube. At the same time, there is no single “right height” for every pilot, because hang height, and hang angle are a matter of pilot preference. Most of us here at the factory prefer a level to slightly head down angle, as that minimizes drag, and we prefer to hang as close to the basetube as possible, as that lengthens the pendulum and thus reduces control pressures, and puts the arms at a more effective angle for exerting lateral control force. Some pilots prefer a more head up angle, for comfort and / or visibility, and some pilots prefer to hang higher above the basetube, as they find they are more comfortable with their arms somewhat extended downwards. These two variables – desired hang height and desired hang angle, along with the length of the suspension straps on your harness, will determine what length hang loop you need to hang at the “right height” in your Wills Wing glider. To order the correct length hang loop, you will need to make a measurement, as described below. Two equal size small stands – paint cans, egg crates, or other sturdy objects of equal height, six inches to 18 inches tall. A four foot piece of rope. Set up your glider as if you were going to fly it. Put the corners of the basetube on your two equal size small stands. Put the rear keel end on a rung of the step ladder, so as to set the keel at about a 25 degree nose up angle (about the attitude of the glider at trim). Put your harness on and clip into the glider and lay down. Zip up your harness. Set your pitch adjuster for the body angle you want to fly at (not for the height above the basetube). Note how much too high, or too low, you are hanging relative to the basetube, as compared to where you ideally want to hang. With your piece of rope, make a loop to lengthen your hang loop, or, if you’re too low, make a shorter loop that substitutes for your hang loop (but hangs in the same place on the keel) to provide your desired hang height. Check your hang angle (body angle) again and make sure it’s what you want. Re-adjust your hang angle with the harness pitch adjuster, and re-adjust your hang height by adjusting the length of the rope loop, as many times as necessary, until you’re hanging exactly as you want to in both height above the basetube and angle of your body. Unhook from the glider and measure the distance from the point on your loop where you clipped in, to the top surface of the center of your basetube. (Be sure to pull on the loop so as to create a straight-line distance to the basetube). Write down this number. The distance you measured (clip in point to basetube). The control bar type and size, if multiple control bar options were available on your model of glider. Note that hang loops must be ordered through an authorized WW dealer – they cannot be ordered for retail direct sale. 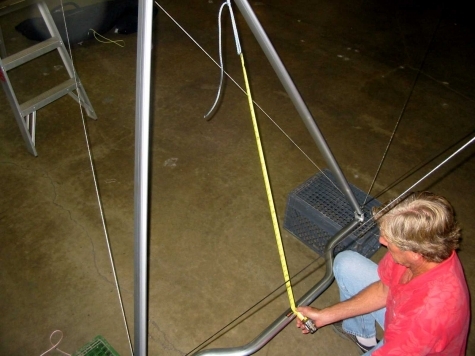 If you KNOW that your Wills Wing glider has a standard WW length hang loop, (in other words, if you’ve MADE the measurement above and you got 55 inches), you can order a custom loop as “X inches longer (or shorter) than stock,” where X is how many inches higher, or lower that you wish to hang. That is actually how we will give the information to the fabricators in the shop who will make your loop: as a variation on the stock WW length. HOWEVER, do not assume that a given WW glider necessarily has a stock WW length loop unless you’ve verified it by measuring. Another owner may have installed a custom loop of a different length. Also note that when you measure your desired clip in point to basetube distance, if you measure a distance which is LESS than 55 inches, that means you need a hang loop which is LONGER than stock. DO NOT order a hang loop by specifying the length of the loop itself, or the distance from the keel to the hang loop, or any other measurement other than the ones specified above. It may be possible for us to convert your measurement to the correct production dimension, but the chance of error or miscommunication is high, and the cost of processing, even if we get it right, is also high. The DHV (the German hang glider and paraglider standards setting body) has also established a standard hang distance that is different from the Wills Wing standard distance. The DHV standard is 1.2 meters – which is about 47 inches. (47.244 if you want to get picky, but it’s pretty hard to make something like a hang loop to five significant digits of accuracy, so we just call it 47.) So a DHV loop is eight inches longer than a stock WW loop. If it turns out that your measurement, obtained by the process described above, is 47 inches, then you can just order a “DHV length” hang loop, although you still need to specify the glider model and size, and control bar option if applicable. Another option for getting your hang height right is to change the length of the main supports and other supporting lines on your harness. This will be a significantly more complicated project than simply ordering a custom hang loop, and we generally recommend against it. 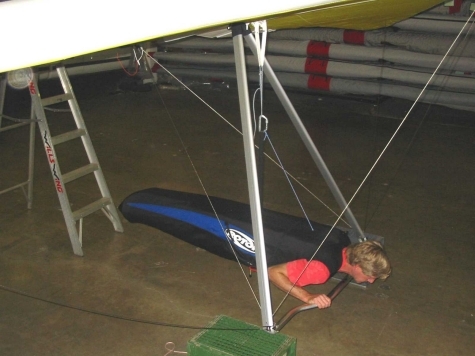 The main support straps and other support lines on a normal, stock Wills Wing made harness are sized in length with the intention that the harness will hang the pilot at an appropriate height in a Wills Wing glider fitted with a stock WW length hang loop. (Note that this will not necessarily mean that a stock Wills Wing made harness will hang you at your desired length in a Wills Wing glider fitted with a stock hang loop – for reasons discussed both above, and below.) 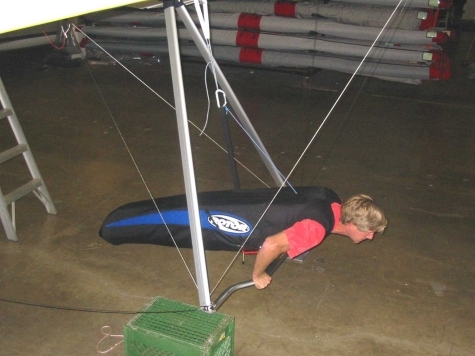 We offer the option, when you order a Wills Wing made harness, of ordering the harness with “DHV mains.” This means that the main support straps (and other support lines) will be sized to as to make the harness overall height eight inches shorter than normal, such that it would hang at an appropriate height in a WW glider fitted with a DHV length hang loop. Since many non-WW gliders are made with DHV compatible hang loops, some pilots order their harnesses with the DHV compatible mains, so that they can hook in to other brands of gliders. We’re happy to accept a harness order for a Wills Wing made harness that specifies DHV length main supports, HOWEVER, you need to be aware that shortening the harness suspension length makes the angle of the front to rear support ropes more acute, putting increased pressure on the shoulders, and measurably compromising the comfort of the harness. This is not a factor on a harness with a solid backplate, but on a “soft” harness such as a Z5, the shorter mains reduce harness comfort to a significant degree. The Rotor harnesses are not manufactured by Wills Wing. In our experience, the mains length on Rotor harnesses varies somewhat, and is not necessarily DHV compatible length. We have had pilots order hang loops ranging from eight inches longer than WW stock (i.e. DHV length), to thirteen inches longer than stock to obtain the desired hang height on their Rotor harnesses. There is no option for specifying custom length mains when ordering a Rotor harness. Why Don’t All Manufacturers of Gliders and Harnesses Standardize On A Single Hang Dimension – Wouldn’t That Make Everything Easier? Why Doesn’t Wills Wing Convert To The DHV Standard? The idea of standardizing on a single dimension for gliders and harnesses is a good idea, and it is what was behind the DHV’s decision to come up with a standard. Unfortunately, it doesn’t really work, for all of the reasons stated above, and for a few more. First, as we’ve said, different pilots prefer to hang at different heights, and different body angles, so a single standard would not be acceptable to everyone, and pilots would still need to customize their equipment to get what they want. Even if everyone wanted to hang at the same height (which they don’t), a pilot who wants to hang more head up will actually need a longer suspension length to hang at the same height than will someone who prefers to hang level or head down. Also, inevitable production variations in harness manufacture, including the effects of sizing modifications to accommodate different pilot measurements, change the effective suspension length in complex ways. Finally, two pilots of different girth, who may well fit properly in the same harness, will hang at different heights, because the way the circumference of the harness fits the circumference of the pilot’s body will change the hang height. The Wills Wing standard hang distance significantly predates that of the DHV. Wills Wing has chosen not to convert to the DHV standard because of how that would compromise the comfort of the harnesses we make, as explained above, and because if we converted our standard hang loop dimension on all of our gliders to a longer length at this time, it would make those gliders incompatible with all of the normal WW length harnesses that we have produced to date. We do offer on any new glider order, the option of an additional DHV length or custom length hang loop set for a minimal extra charge of $15.